That is what the website says word for word. A normal reaction to all this would have been to go buy a shovel immediately, dig myself free, and find a better parking spot. But wikihow was mocking me, so I went back inside my apartment feeling defeated and didn’t leave for the rest of the day. There was more snow on Sunday, and I knew the situation would only be getting worse – so I watched all 10 episodes of Sean Saves the World, the new sitcom starring Sean Hayes as a single, gay dad. (Can you tell I avoid my problems?) I even had a friend text me that she would help dig me out, but I stayed on the couch. It wasn’t until Wednesday (when the city of Chicago reached an almost tropical 14 degrees) that I bought a shovel on my way home from work. I had to take the shovel on the train because my car was still submerged in snow – hence the need for a shovel. I could feel the commuters on the Red Line looking at me and my shovel and thinking, “Silly girl. You get the shovel BEFORE the snow,” but maybe that was just my imagination. When I got off the train, it was cold and dark outside. So I did what I do best and decided to put the snow-shoveling off until the next morning. 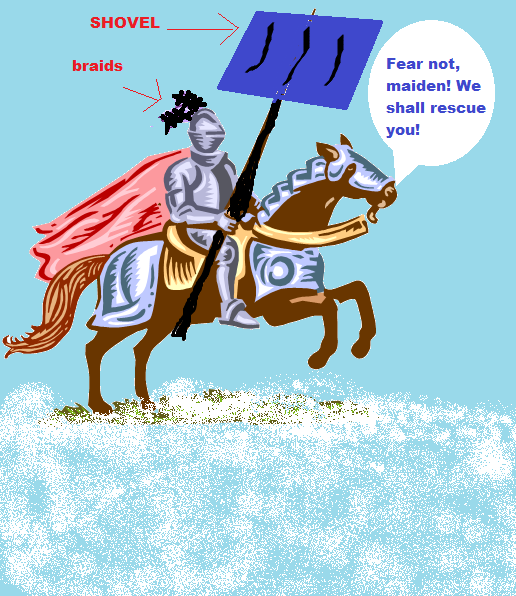 I didn’t take a picture of Braid Man, so here is my artistic interpretation using ClipArt and Paint. I would have taken a real picture, but then I wouldn’t have been helping with the digging process. 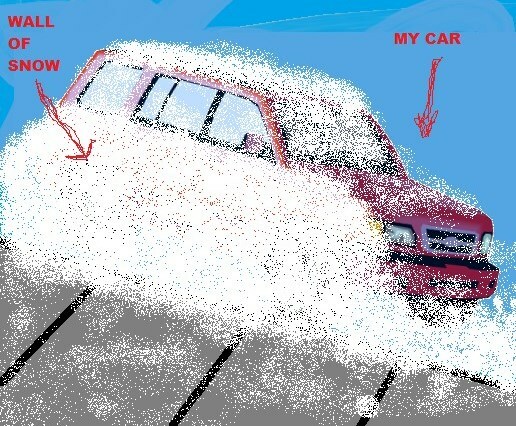 However, this picture is pretty accurate, except there was even more snow. Once Braid Man had gotten rid of most of the snow (while all I really did was clear my windshield and break my ice scraper in the process), he told me to get in the car and try to drive out. The car moved some before getting stuck in a fresh pile of snow, but Braid Man would not be thwarted! He pushed my car from the front and then the back, and continued to clear the snow and ice each time the car stopped moving. A gentleman walking by on the sidewalk stopped to watch our maneuvers and give some helpful tips on which tire was stuck. He eventually lost interest – I’m not sure Braid Man appreciated his comments. Finally, after close to 30 minutes my car was free! During the digging process, I tried to express my gratitude. ‘You’re an angel’, ‘What would I have done without you’, ‘I appreciate this so much’. Once I was out of my parking spot, I wanted to thank him one more time. But he just handed me my shovel and walked away before I could say anything. Kind of like a cowboy walking into the sunset at the end of a movie. OR like my own personal Dennis Quaid (another Day After Tomorrow reference! )- conquering the frozen elements to come to my rescue. Thank you Braid man, wherever you are. And thank you Dennis Quaid, just for being handsome.